Time is running out to participate in my social media poll. In trying to figure out where to spend my limited time online, I'd love to know where you hang out. So, if you have ... ten seconds, please check off the social media platforms you use. It's totally anonymous, and the poll will close at the end of the day on Thursday 1 October. P.S. 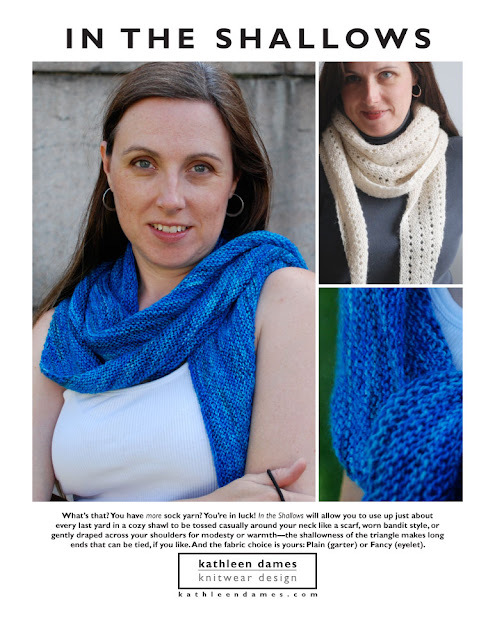 You can find me on most social media platforms as @kathleendames, and I'm Purly on Ravelry. Well, that's not hugely helpful, is it? And I'm not sure I needed to know the verb definition of cape. Construction-wise, I think of a cape as not-a-poncho, and a poncho as something with corners. 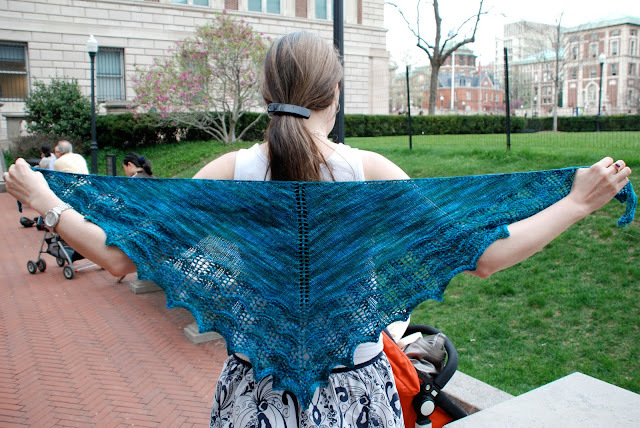 The first large-scale project I ever knit was a poncho from Melanie Falick's Weekend Knitting, which was a big rectangle that you poncho-ized by sewing one short end to the bottom of one of the long sides. It ends up with only one pointy bit (corner), but it definitely qualifies. I've seen other ponchos where you sew two rectangles together leaving a slit in the middle for your head. Or you could even knit a square with a hole in the middle. 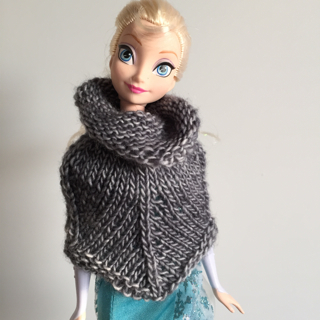 All these poncho ideas seem to me to have come out of the serape when someone got tired of wrapping the rectangle of fabric around themselves and just sewed it mostly shut. The thing about both of these capes is that they are shaped in the yoke to sit better on the shoulders and fit the body more closely. Some days I might want a drapey, flowing thing to wear, but generally I prefer something with a closer fit. What do you think? Is Caught in the Rigging a cape or a poncho? Let me know in the comments or come over to the Ravelry group. We can discuss it in this thread. 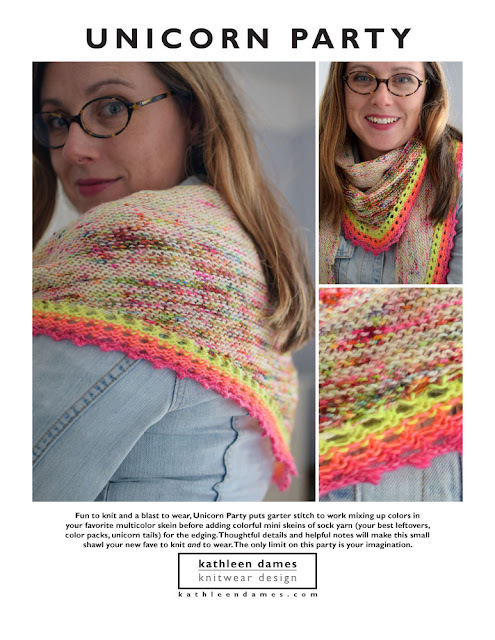 Fun to knit and a blast to wear, Unicorn Party puts garter stitch to work mixing up colors in your favorite multicolor skein before adding colorful mini skeins of sock yarn (your best leftovers, color packs, unicorn tails) for the edging. 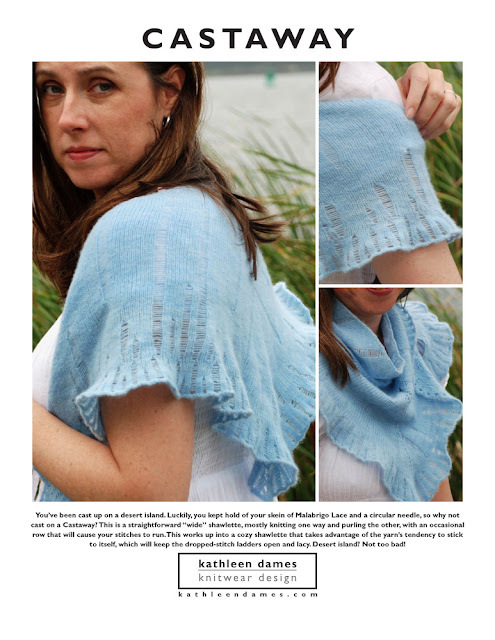 Thoughtful details and helpful notes will make this small shawl your new fave to knit and to wear. The only limit on this party is your imagination. This is a perfect stash buster . 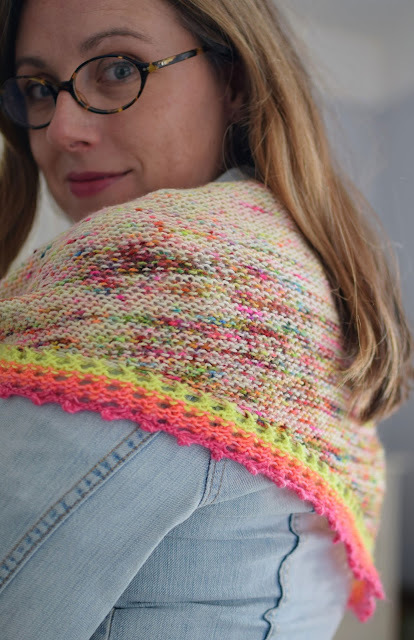 Grab your favorite leftovers or rock one of those gorgeous gradient packs that have taken the knitting world by storm and have a party! 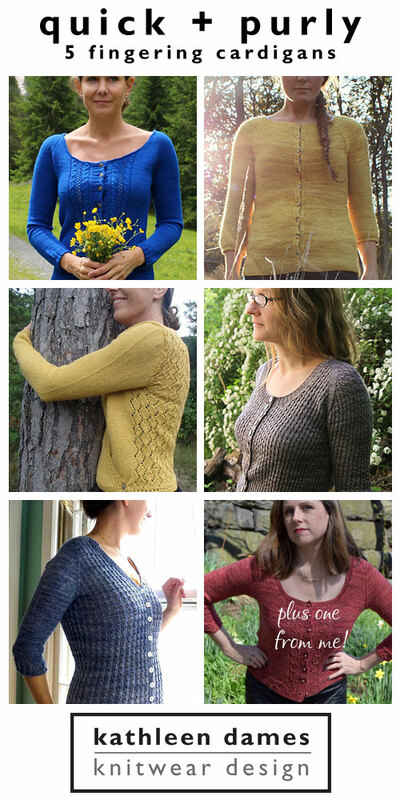 Note: I am a loose knitter. 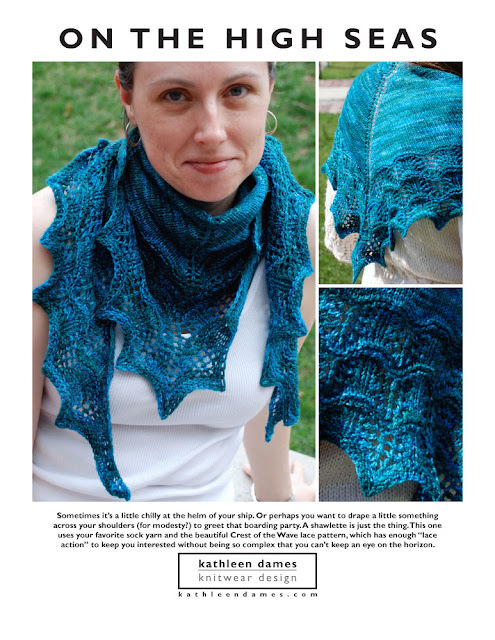 While gauge is not critical in a shawl, you may run out of yarn if your gauge is different from the gauge given. Everything you need to create your own beautiful Unicorn Party is provided in the professionally designed (by me!) pattern. You’ve been cast up on a desert island. 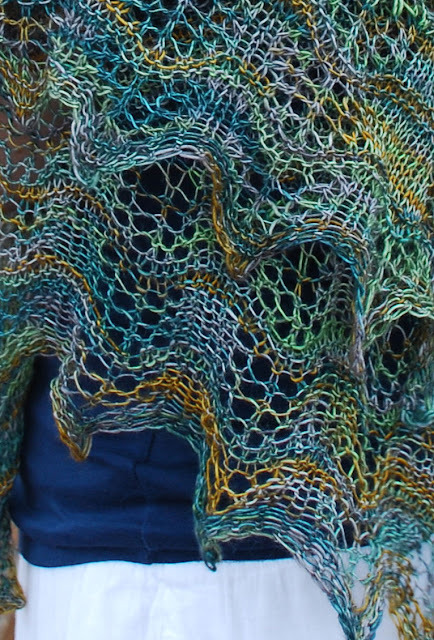 Luckily, you kept hold of your skein of Malabrigo Lace and a circular needle, so why not cast on a Castaway? 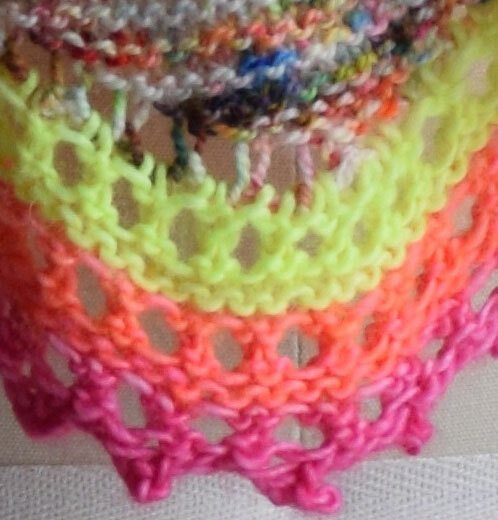 This is a straightforward “wide triangle” shawlette (four increases on the “right” side, two on the “wrong”), mostly knitting one way and purling the other, with an occasional row that will cause your stitches to run. The final section creates a pretty ruffle along the edge. 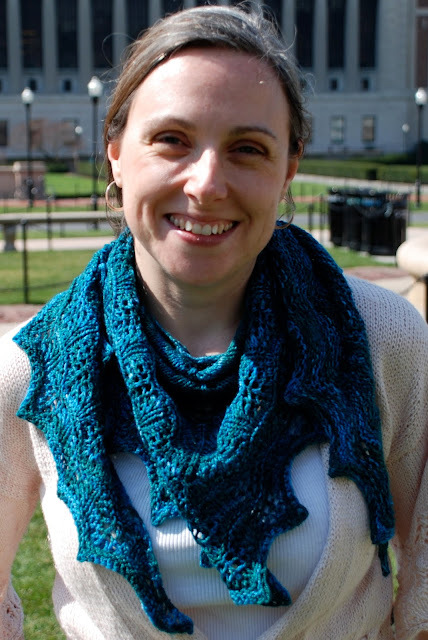 Malabrigo Lace knits up into a divinely soft and cozy shawlette (an LYS owner friend of mine thought it was cashmere!). 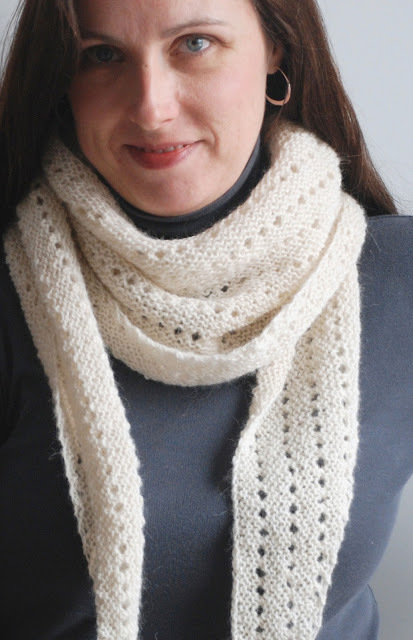 The pattern takes advantage of the yarn’s tendency to be a little sticky, which will keep the dropped-stitch ladders open and lacy. Desert island? Not too bad! Dropping stitches! Remember when you first learned to knit and dropping stitches was so scary? Maybe that was just me, but dropping them here is FUN (and a little subversive). 26 stitches x 44 rows = 4 inches square in Stockinette St.
Everything you need to create your own beautiful Castaway is provided in the professionally designed (by me!) pattern. Sometimes it’s a little chilly at the helm of your ship. Or perhaps you want to drape a little something across your shoulders (for modesty?) to greet that boarding party. 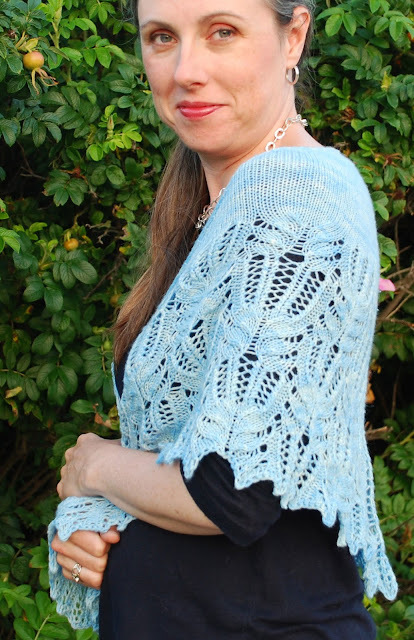 A shawlette is just the thing. 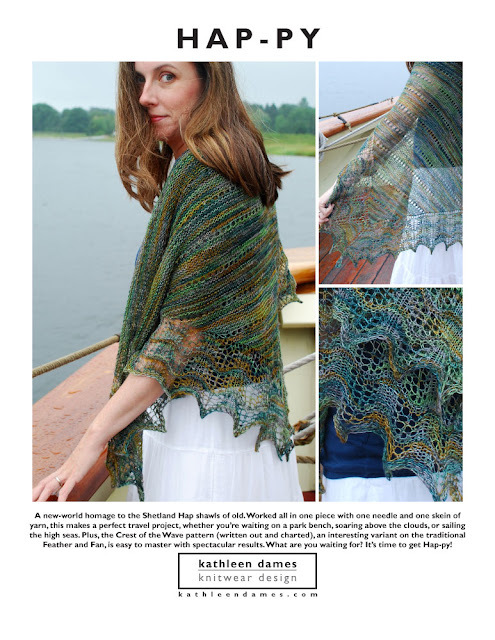 This one uses your favorite sock yarn and the beautiful Crest of the Wave lace pattern, which has enough “lace action” to keep you interested without being so complex that you can’t keep an eye on the horizon. I’ve written out the chart, so if charts don't work for you, you’re out of excuses! 22 sts x 30 rows = 4 inches square in Stockinette St.
Everything you need to create your own beautiful On the High Seas is provided in the professionally designed (by me!) pattern. 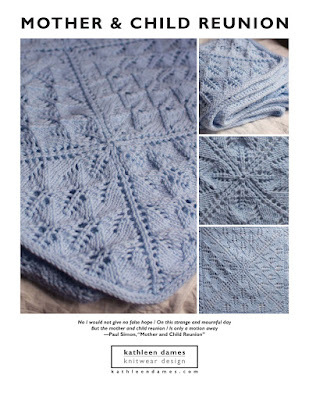 Both written and charted versions of the Spanish Lace stitch pattern are included. What’s that? You have more sock yarn? You’re in luck! 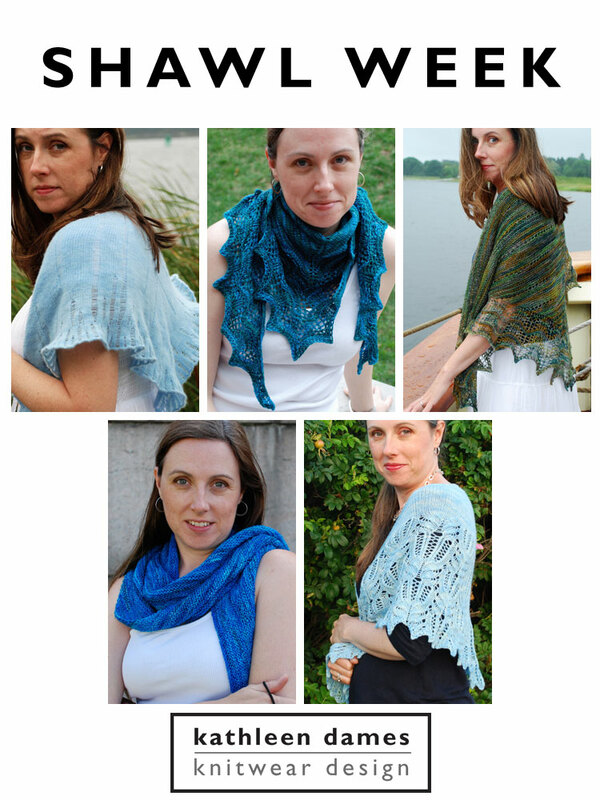 In the Shallows will allow you to use up just about every last yard in a cozy shawl to be tossed casually around your neck like a scarf, worn bandit style, or gently draped across your shoulders for modesty or warmth—the shallowness of the triangle makes long ends that can be tied, if you like. And the fabric choice is yours: Plain (garter) or Fancy (eyelet). After a long detour through Stockinette, I rediscovered the joy and simple pleasure of Garter Stitch. No offense, Stockinette, but sometimes your smoothness and tendency to curl up brings me down (only a little - I love ya, Stockinette). 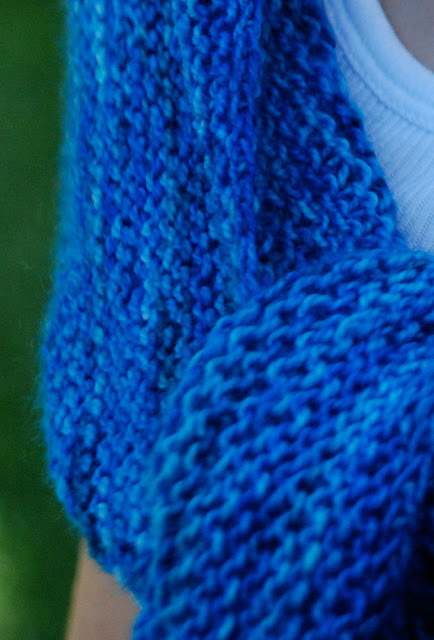 Garter Stitch, with all its squish factor, marvelous ability to lay flat, and awesome ability to mix and mingle stitches in variegated yarn into a more cohesive whole, is awesome too. 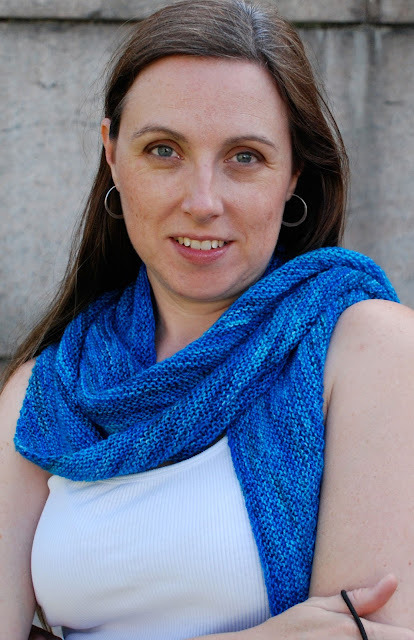 In the Shallows puts Garter Stitch to great use, and you get to decide if you want to be plain or fancy. Better yet: make one of each! You get to wear that skein of yarn you love! 18 sts x 22 ridges = 4 inches square in Garter St.
Everything you need to create your own beautiful In the Shallows is provided in the professionally designed (by me!) pattern. 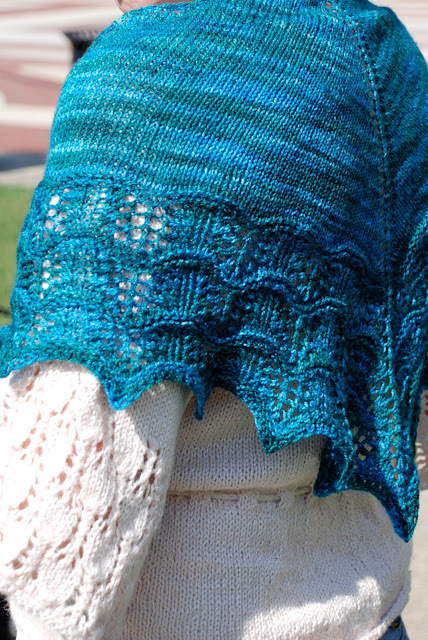 Wrap yourself in a luscious shawl dripping with Spanish Lace before heading out onto the deck of your galleon. 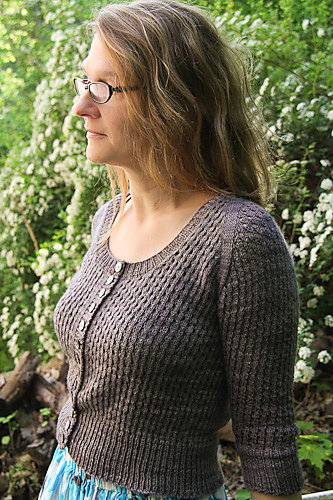 A little stockinette over your shoulders, and then Spanish Lace flows down your back. This worked-on-both-sides lace is so spectacular, it doesn’t need a separate edging, though it will require your concentration. 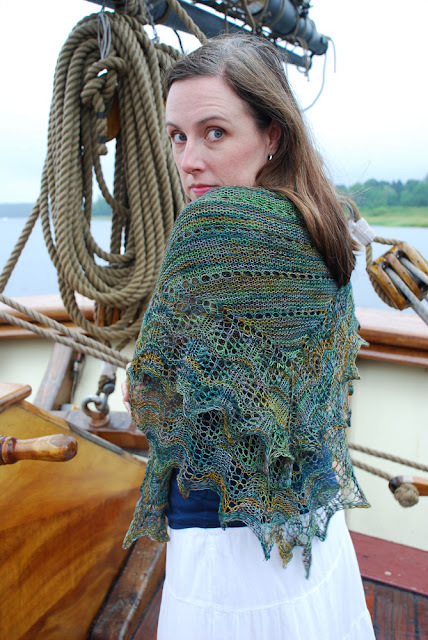 You will have pride of place on the treasure fleet in this extra-wide triangle shawl! 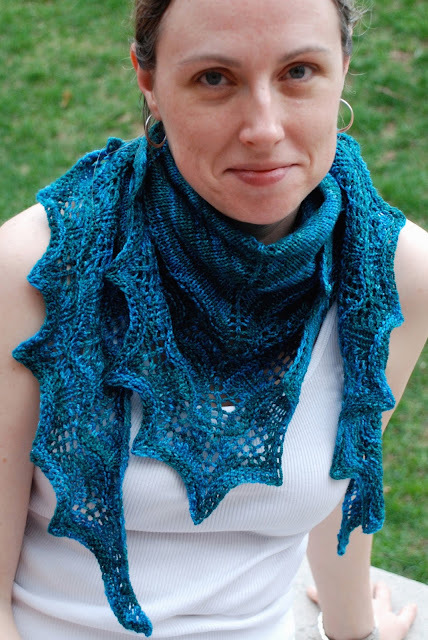 I am excessively fond of the wide triangle shawl. The wider shape places more fabric around your shoulders and upper back, while the shorter depth prevents that "arrow pointing directly at your bum" thing that sometimes happens with standard triangles. 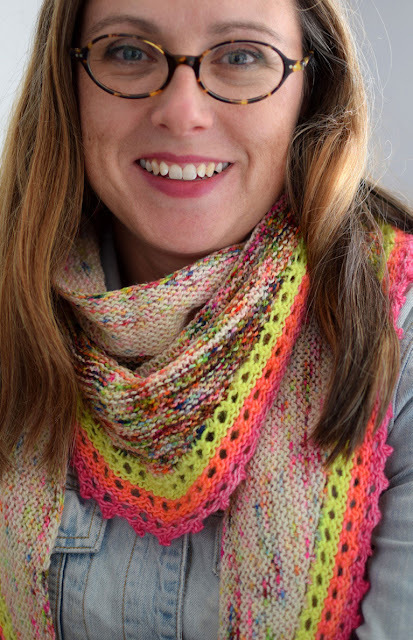 Plus, I find that no matter how gorgeous a shawl, eventually I stop wearing it occasionally as a decorative piece and start wearing it all the time wrapped around my neck for warmth and gorgeousness-close-to-my-face. 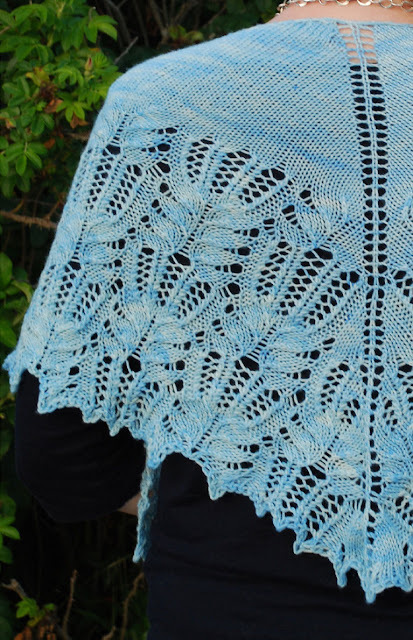 This shape does make lace patterns more complicated to present, since we increase twice as often at the outer edges as we do in the middle of the shawl. But don't worry! 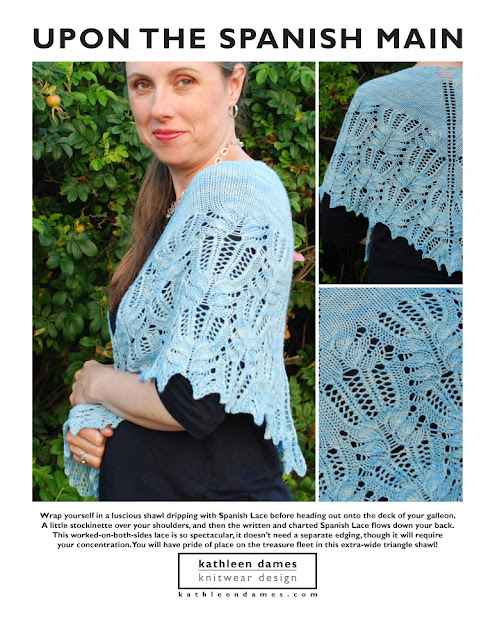 My job is to make your knitting easier, and I have done that here with multiple yet tidy charts and cleverly color-coded written instructions for Spanish Lace. 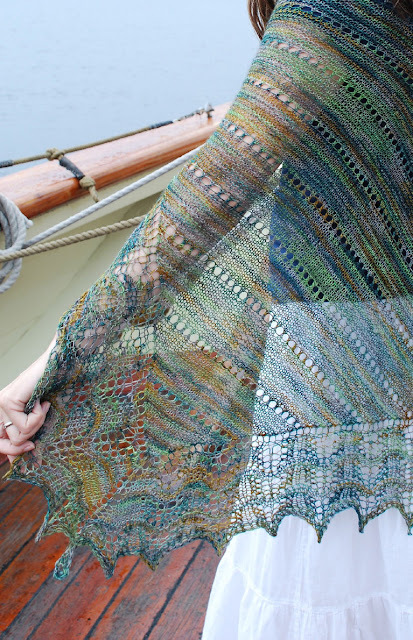 If you've chosen a yarn as decadent as Jill Draper Makes Stuff Splendor Sock (Merino/Cashmere/Nylon), you will want to snuggle up in this shawl all. the. time. Everything you need to create your own beautiful Upon the Spanish Main is provided in the professionally designed (by me!) pattern. 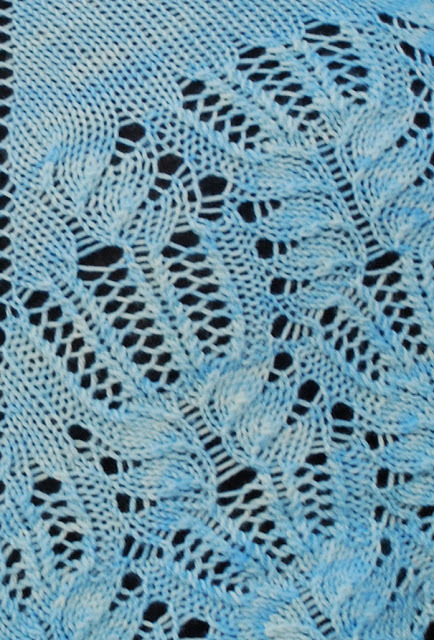 Both written and charted versions of the Spanish Lace stitch pattern are included. All this week I will be releasing upgraded versions of these five lovely shawls. Stay tuned! With cooler nights coming (or already here for some of you), layering and lightweight cardigans are on my radar. Here are five that I would love to have in my cedar chest for Fall (and Spring and all year 'round, really). There were so many fantastic patterns to choose from! Here is the full search, if none of my selections is quite what you're looking for. Then let me know your favorite(s) in the comments below.